Since the bond issue passed two months ago, a lot of work has been going on behind the scenes so we can get to work this coming summer on projects to keep our students Safe, Warm, Dry and Prepared for the Future. The bonds must be issued and proceeds invested, architects and construction managers hired, work prioritized, designed and scheduled. The Board of Education authorized the issuance of the first series of bonds not to exceed $40.5 million at the November 24th Board meeting and we are working with our legal counsel and financial adviser to ensure the bonds will be issued by mid-February. We have also been meeting with various investment firms keeping safety, liquidity and maximum yield as our priorities as we make our decision. Much of the work to be completed in the first series requires Architectural Design and Construction Management services, so Requests for Proposals (RFP’s) were prepared and published in mid-November. Thirteen architectural and construction firms participated in a mandatory walk-through led by Rex Clary, Facilities Director on November 25th, the day before Thanksgiving. Bids were received December 4th and after a final in-depth presentation and interview process with the top three architectural and construction management firms, Kingscott and Clark Construction were selected. In preparing to issue the RFP’s, the Series 1 projects were prioritized and rough completion timelines were developed. Much of the Series 1 work revolves around safety and security – secure entrances and safer traffic patterns for drop off/pick up and bus drop off. Other projects will include classroom updates for Next Generation learning and energy efficiency projects such as lighting replacements and HVAC updates. We plan to complete the majority of work for the secure entrances and safer traffic patterns during the summer of 2016. A preliminary design meeting was held on December 21st, which included the Saline Area Schools Bond Committee and representatives for both Kingscott and Clark Construction. Consultants with expertise in areas such as security, technology and traffic patterns will be included as needed and weekly meetings have been scheduled to ensure successful completion of our Series 1 projects. We will continue to work “behind the scenes” to make sure our bond projects are successful and we want to make sure information is provided to the community in a way that makes sense. Toward that end, Superintendent Graden will conduct focus groups on January 25th and 26th to see how the public would like to receive information on the bond projects, progress updates and how the projects will impact the district. You might think that the budget is something that is looked at once or twice a year, but for public schools, it really is a year-round process. The General Fund original budget must be set before July 1st of the new fiscal year. An amended budget is typically presented mid-year, between November – February and a final amended budget is presented to the board again in late May/June. Much of the information we need to set the original budget is based on the School Aid Fund budget that is approved by the Michigan legislature and signed by the Governor. The Governor releases his Executive Budget Recommendations in early February. The House and the Senate then both determine their own versions of the budget, resolve their differences and present a final version to the Governor for approval. This may not happen until late in the spring, but hopefully is settled sometime in May. Since the foundation allowance and state categorical revenues make up about 85% of the total revenue we receive in Saline, the School Aid Fund budget is one of the most important pieces of information needed to prepare the original budget for the next fiscal year. But student enrollment projections are also needed, as the state revenues are calculated “per pupil”. Student enrollment is “counted” by the State twice – once in October and once in February – and a “blended count” is then used to determine our Foundation and categorical revenues. We must estimate what our enrollment will be for both of those counts when preparing the original budget. For the last several years, we have had enrollment projections prepared by an outside source, and the projections take into account both State and Local demographic trends. On the expenditure side, staff costs are approximately 87% of our total expenses. If contracts are in place for the coming year, we have much of the information needed, however, staffing needs do change over the summer and health benefit enrollment doesn’t take place until after the start of the school year. Utility costs are estimated on past use and anticipated rates. Saline participates in a consortium for our electricity and has locked in heating rates for three years based on our average usage. But unusual weather can make a big impact on our budget. The Polar Vortex we experienced in the winter of 2014 for example increased our district wide utility costs by approximately $400,000 for the year. District goals for the coming year, as well as technology and facility needs must also be determined and prioritized, based on available funds. This information comes from individual meetings with administrators from each Building/Department and is reviewed with both Central Administration and the Board of Education Finance Committee. Once the original budget is prepared, it must be available for public review for a period of at least six days and a public hearing regarding the budget and the proposed property tax millage rates must be held prior to the adoption of the budget. The budget must be posted on the district website within 30 days of adoption by the Board of Education. A budget amendment is warranted whenever the district is aware that resources are not sufficient to fund original appropriations or when additional information is gathered that substantially affects the budget. Saline prepares an amended budget between November – February. The updated budget is adopted by the Board of Education and posted to the district website, but does not require a public hearing. The final budget amendment is prepared and adopted at the same time as the original budget for the following fiscal year, in late May/early June. The final budget amendment should reflect as accurately as possible, the actual revenue/expenditures for the fiscal year and is compared to actual revenue/expenditures in the Financial Audit Report. The Department of Education reviews the financials of all districts and any discrepancies greater than 1% of total revenues or total expenditures require an explanation by the district to the Department of Education Office of Audits. All budgets for other funds (Community Education, Food Service, Debt, Capital Projects, Sinking Fund) are prepared on the same schedule as the General Fund, but do not always required a mid-year amendment. At the conclusion of each fiscal year, an independent audit of the District’s financial records must be completed and the Financial Report is presented to the Board of Education and posted on the district website for public review. The audit is conducted in accordance with generally accepted auditing standards to provide reasonable assurance that the financial statements are free from material misstatement. Internal controls of the district are reviewed and audit procedures and samples are determined in part, based on that review. The Financial Report for the 2013-14 Fiscal Year will be delivered to the Board of Education at the October 28, 2014 Board Meeting, finalizing the budget and review process for that fiscal year, which began 18 months earlier with the creation of the original budget. We are now starting to work on an amended budget for 2014-15, to be presented to the Board sometime in the next three months. So no matter what time of year, it is always Budget Season. Continue to investigate ways to reduce expenditures, while maintaining the core mission and values of Saline Area Schools. Continue to investigate ways to increase revenues, while maintaining the core mission and values of Saline Area Schools. Return Fund Balance to 5% and continue to work toward 10% Fund Balance. Develop and implement a financial reporting strategy to increase community financial literacy and engagement. A five year forecasting tool was developed and presented to the Board of Education on November 26, 2013. As we develop our budgets for future years, we will be able to see the long term impact of projected changes. There are several areas on both the revenue and expenditure side where we can make budget “changes” and see that impact – Foundation Allowance, Student Enrollment, Employment Costs (salary, retirement, health benefit costs), Utilities, etc. As we’ve seen in the past five years however, the landscape of school finance is ever-changing and this tool cannot predict what those changes will be. As we begin to use the tool, we will continue to refine it and improve its value in the decision-making process. Steps have been taken to reduce our trash disposal costs by “right-sizing” our trash dumpsters and pick up schedule. We will also be increasing our push for recycling, which should reduce the demand on our trash dumpsters. We continue to take advantage of all revenue available to us through traditional sources and we are working to initiate new partnerships and strengthen existing partnerships that can support and expand the curriculum offerings for our students. Additionally, we are auctioning off unused inventory that was being stored at Houghton Elementary and we are evaluating a variety of options regarding the Houghton property. As of June 30, 2013, our Fund Balance stands at 4.06% (of total expenditures), up from 2.32% in 2011-2012, so we are on the right track. We continue to watch our revenues and expenditures with the intent of adding to our fund balance and will continue to apply one time revenues toward building our fund balance. For example, in 2012-13, we sold a parcel of land at the corner of Woodland and Maple and added $519,000 to our fund balance. This blog was started during the 2012-13 school year and the History of School Funding, Basics of Fund Accounting and the Importance of Fund Balance and the Operating Millage Renewal have been covered. The Finance Office has also started a series of e-mails to all staff, providing various information that may be helpful to them, such as Finance Office policies and procedures, updates on our conversion to a new financial software system, and information on school finance and our financial statements. We have also opened a Twitter account and blog posts are uploaded to the Saline Area Schools Facebook page. Action Steps 2 and 3 call for the development of consultative groups composed of interested community and staff members. These groups would meet 2-4 times annually to discuss possible ways to reduce expenditures or increase revenue and recommendations would then be presented to Central Administration for consideration. Ideally, there will be one group for expenditure reduction and a second group for revenue creation, but depending on community and staff interest, it could be one group. Additionally, Action Step 5 calls for the development of a similar consultative group to assist with sharing financial news with the community. This group would provide potential topics that are of interest to the community and staff, develop ways to “get the word out” and provide feedback on how well we are sharing news with the community and staff. If you have some great ideas you would like to discuss and are willing to attend meetings 2-4 times per year in any of those areas, please contact me at warnerj@salineschools.org or (734) 429-8012. I would anticipate our first meetings to begin in January/February, with future meetings scheduled on a quarterly basis. On November 5th, voters in the Saline Area Schools district will be asked to vote on a renewal of our operating millage. The last time the operating millage was approved by voters was 20 years ago in 1994 after the passage of Proposal A, which fundamentally changed the way public schools were funded in Michigan. This renewal will allow the district to continue to collect 18 mills for an additional 10 years and it will have NO COST IMPACT ON HOMEOWNERS, as the millage is not levied on an individual’s principal residence. The renewal of the millage will continue and not change the rate currently levied on non-homestead property, such as commercial/industrial property, apartment buildings, rental homes, vacation properties and vacant land. No more than 18.0000 mills will ever be levied and will only be levied on the various types of Non-Homestead properties. Prior to 1994, schools were primarily funded at the local level and the millage rate levied on properties was determined at the local level. Funding for districts varied considerably, ranging from a low of $3,398 per student to a high of $10,000 per student. Over a 30 year period, more than 12 ballot proposals were presented to Michigan voters to change the way that schools were funded, but none passed until 1994. With the passage of “Proposal A”, schools would receive a “Foundation Allowance” determined by the State each year. The foundation allowance is funded by both local and State funds and was intended to provide more stable funding for districts throughout the State. A property tax of 6 mills collected on all but a few exempted properties in the State, this State Education Property Tax is the primary source of revenue for the School Aid Fund. This tax IS paid on each primary residence and can be seen on property tax bills as “State Education Tax”. These funds are sent to the State and are earmarked for the State School Aid Fund. The reason we are asking for 22.2867 mills instead of just 18.0000 mills is because of the Headlee Rollback, which was passed in 1978. When annual growth on existing property tax values is GREATER than the rate of inflation, the millage must be reduced – or rolled back – to keep taxes from increasing more than the rate of inflaction. Any rollback in millage is permanent. For Saline Area Schools, our millage has been rolled back several times over the last 20 years and currently is at 17.3357 mills. In 2000, Saline Area School voters approved a “Headlee Override” millage of 5.0000 mills. Any future rollbacks to the originally authorized millage of 18.0000 mills were covered by this new millage, so we would always receive the full 18.0000 mills. The annual growth on existing property tax values was greater than the rate of inflation in various years so our original millage has been permanently reduced to 17.3357 mills. We make up the difference from the Headlee Override millage approved in 2000. The full 22.2867 mills called for in the renewal proposal is equal to what we had available on the expiring millage and it gives the district a cushion of 4.2867 mills to make up any difference from the Headlee Rollback. However, no more than 18.0000 mills will ever be levied on non-homestead property. This operating millage is not unique to Saline Area Schools. Every public school district in Michigan receives funding in the same way and to the best of our knowledge, every district is currently collecting this millage. This proposal will allow the school district to continue to levy the statutory rate of 18 mills on all property, except principal residence and other property exempted by law, required for the school district to receive its revenue per pupil foundation allowance. Shall the limitation on the amount of taxes which may be assessed against all property, except principal residence and other property exempted by law, in Saline Area Schools, Washtenaw County, Michigan, be increased by 22.2867 mills ($22.2867 on each $1,000 of taxable valuation) for a period of 10 years, 2014 to 2023, inclusive, to provide funds for operating purposes; the estimate of the revenue the school district will collect if the millage is approved and levied in 2014 is approximately $7,972,045 (this is a renewal of millage which expired with the 2013 tax levy)? General Fund – All the primary operational revenue and expenditures are accounted for within this fund. Special Revenue Funds – Revenue that must be accounted for separately by law would be accounted for within a Special Revenue Fund. Saline Area Schools has separate funds for Community Education/CARES, Food Service and Maintenance and Equipment. Capital Projects Funds – Any projects using revenue from a Bond proposal must be tracked separately in a Capital Projects Fund. Saline does not currently have any Capital Project Funds. Typically, Capital Project Funds are used to build new or renovate existing buildings, purchase technology, and purchase buses. General operating costs cannot be paid from this fund. Debt Service Fund – The Principal and Interest that is paid on long-term debts must be tracked in a Debt Service Fund. Saline has two Debt Service Funds for past bond issues. Sinking Fund – Saline District residents are currently assessed .35 mills for the Sinking Fund. The use of sinking funds is restricted primarily to large scale building repairs. General operating costs (including most repairs) cannot be paid from this fund. Student Activity Fund – Saline Area Schools maintains a Student Activity Fund, which encompasses approximately 200 sub-accounts for school clubs, athletic teams, smaller scholarships, school trips (such as Toronto Trip, Washington DC Trip), Class Accounts, etc. South West Washtenaw Consortium – Saline Area Schools is the fiduciary for the SWWC, which means that we maintain the accounts for all of their revenues and expenditures. Their fund is audited and reported to the State through Saline Area Schools. Trust Accounts – Saline Area Schools maintains several Trust Accounts within the Trust Fund on behalf of individuals or entities that provide scholarships to our students. The Assets, Liabilities, Equity, Revenue and Expenditures of each Fund are accounted for and reported separately and the funds cannot be comingled. For example, Sinking Fund revenue can only be used for very specific purposes and cannot be used to pay for operational expenses. The General Fund is the main fund that garners the most attention. All of the general operating expenses of a district are paid from the General Fund. Expenses are tracked by school or department, so within Saline Area Schools, we track the expenses of 7 school locations, Special Education, At Risk, various grants (Title I and II, IDEA, ELL, etc.) and operational departments such as Maintenance, Technology, Transportation, Finance Office, Human Resources, Curriculum, Registration, etc. The District will maintain a minimum unassigned fund balance in its General Fund ranging from 5 (five) percent to 20 (twenty) percent of annual expenditures and outgoing transfers. This minimum fund balance is to protect against cash flow shortfalls related to timing of projected revenue receipts and to maintain a budget stabilization commitment. Our Fund Balance has been below the minimum required 5% of annual expenditures for the last two years (2.32% in 11-12 and projected to be 3.81% in 12-13), due in large part to three different issues: reduction in state funding, declining enrollment and staff contracts through June 2012. All staff contracts were renegotiated and two year contracts were signed for the 2012-13 and 2013-14 school years, which aligned costs with our current revenue stream. With the approval of the 2013-14 budget, we have returned our Fund Balance to 5% and now can work toward increasing that balance. Why is Fund Balance so Important? As of June 30, 2014, we are projected to have a Fund Balance of $2,596,487 or 5.13% of annual expenditures. This is a snapshot of our financial status as of that date and does not mean that we will have a surplus of over $2.5 million each day throughout the year. It also includes receivables and inventory, so it is not all available cash. Maintaining an adequate Fund Balance affects us in both the short and long term. It allows the District to meet our day to day obligations and also allows us to adjust for sudden decreases in revenue or unexpected expenses, without having to make abrupt changes in our programming or services. In 2010-11, the District balanced the budget by: cutting expenditures (selling Union School/closing Houghton), reducing expenditures (laid off staff, eliminated positions and received contract concessions) and using cash ($1.5 million of available Fund Balance). The fact that we had a little over 5% fund balance at the end of 2009-10, allowed the District use that three-pronged approach to maintain quality programs throughout the District, while weathering an economic downturn. If we had not had that Fund Balance available, we would have had to make difficult decisions on what programs or services to eliminate. Our primary sources of income are State Aid, Property Tax and grant revenue. 1. Our fiscal year begins on July 1st and we don’t begin receiving State Aid revenue until October 20th – nearly 4 months after the start of the fiscal year. 2. Although we are still receiving State Aid payments in July and August (for the previous fiscal year), we don’t receive any payment in September. 3. Revenue is received on the 20th of the month (or the next business day), and there are several months throughout the year where we either have two pay dates that fall prior to receipt of our State Aid that month, or we have three pay dates in a month. Saline Area Schools collects all local property tax revenue in the summer (this is the 18.0000 mills collected on non-homestead property). We receive the majority of the property tax revenue in August and September, and smaller amounts October – June. The receipt of this revenue early in the fiscal year helps us through the early part of the year, especially in September when we don’t receive any State Aid revenue. But it also means our cash flow decreases in the later part of our fiscal year. Our total grant and Act 18 (Special Education reimbursement from the WISD) revenue for the fiscal year is less than $7.0 million. Requesting grant reimbursement on a monthly basis improves our cash flow position and Act 18 revenue is received in October/December/February/April/June. 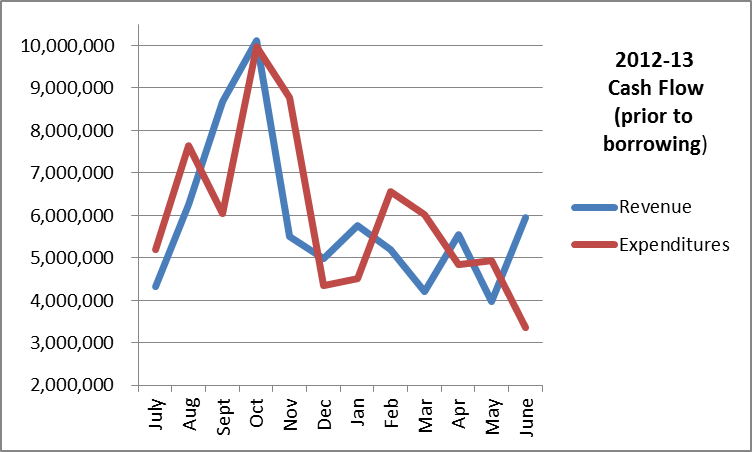 As you can see from the chart below, there were several times throughout the 2012-13 fiscal year where our monthly expenses (red) were more than our monthly revenue (blue). 1. Speed up the receipt of revenue – unfortunately, we have little to no control over the receipt of most of our revenues. b. Time payment of invoices so payment is made just prior to incurring late charges/interest charges, which we do as a standard practice. a. We will borrow $3.5 million in fiscal year 2013-14 to make sure we can meet our cash flow needs. b. This will cost the District $35,000 – $45,000 in interest and legal fees because interest costs are very low right now. Interest costs will not always be so low. 4. Maintain a Fund Balance large enough to meet cash flow needs. How large would our Fund Balance need to be in order to meet our cash flow needs? The Michigan School Business Officials Association (MSBO) recommends that Districts maintain a fund balance of 15% of expenditures, giving a cushion of just under 2 months of expenditures. If a district is saving for a future purchase (such as buses or technology), the Fund Balance could be more. As of 2010-11, the average fund balance in the State of Michigan was 11.12%, so we are substantially below either the recommended or the average. The expenses of one pay period (salary, benefits, taxes) are just under $2.0 million dollars, so our projected Fund Balance as of June 30, 2014, will cover about 1-1/4 pay periods. Our Strategic Framework suggest a Fund Balance of 10%, which would equate to $5.0 million and would cover the costs of two pay periods (typical for one month) and leave a little room to cover additional expenses. We would still need to borrow approximately $1.0 million to meet all our cash flow needs, but our interest costs would be substantially less. To meet the state average, we would need to have a $5.6 million Fund Balance and to meet the recommendation of the MSBO, we would need to have a $7.6 million Fund Balance. There are always pressing needs in a District and we must balance those needs with the need to make sure we can weather any future economic downturn or unexpected emergency expenditure. Additionally, having a relatively small Fund Balance affects our credit rating. We would be considered a higher risk, our credit rating would be hurt and our cost to borrow would increase. We have been reducing costs and delaying expenditures for several years and we would like to reduce class sizes, update student and staff technology, repair building roofs, heating systems, etc. But we need to plan for the future as well and make sure we have an adequate Fund Balance to weather the continued uncertain economic conditions. Going back as far as 1963, schools were primarily funded at the local level. Local school districts held elections, which determined the millage rate for property taxes that would fund the school system. On average, districts received 69% of their funding from local sources and 31% from State sources. This meant that funding for districts varied considerably, ranging from a high of over $10,000 per student to a low of only $3,398. Between 1963 and 1994 there were over 12 ballot proposals to change the way schools were funded, but none passed. In 1994 however, Proposal A passed and it fundamentally changed the way schools were funded. The majority of school funding is now funneled through the State Foundation Allowance and other categorical allowances, while a limited amount of funding continues to come from local sources. There are several districts in the State that have a “hold-harmless” status. At the time of Proposal A, the maximum foundation allowance that was to be paid by the State was significantly less than the amount of funding these districts had been receiving. These few districts were allowed to levy additional taxes to make up the difference in funding and those taxes are levied first on homestead property. Only those districts are allowed to levy additional taxes to support the operational (or General Fund) of their district – the majority of districts are capped at collecting 18 mills on Non-Homestead properties. In Washtenaw County, only Ann Arbor Public Schools has this “hold-harmless” status. Although determined by the State each year, the foundation allowance is actually funded by both local and State funds. A property tax of 18 mills is collected on Non-Homestead properties (commercial, industrial, development and personal property) and these funds are paid directly to the District. Taxpayers do NOT pay this tax on their primary residence. For Saline Area Schools, this accounts for approximately $6.7 million of our funding. The primary source of revenue for the School Aid Fund is from the State Education Property Tax, which is 6 mills collected on all but a few exempted properties in the State. This tax IS paid on your primary residence and you will see it on your property tax bill as “State Education Tax”. These funds are sent to the State and are earmarked for the State School Aid Fund. Additional funds for the School Aid Fund come from a variety of sources. The State determines the per-pupil amount of taxes that are collected at the local level and subtracts that amount from the foundation allowance. (See Example A). As taxable values goes down, as we have experienced in recent years, the State must pick up a larger portion of the foundation allowance. When taxable values increase, there is less strain on the State. $7,000,000 – $2,000,000 = $5,000,000, which is the amount of funding received from the State. In addition to the per-pupil Foundation Allowance, districts in Michigan also receive funding through “Categoricals”, which is special funding as determined by the State. Categorical funding is not guaranteed to continue from year to year. Much of the current categorical funding is in place because the foundation allowance has been reduced in the last several years and categorical funding can be adjusted more easily year-to-year than the foundation allowance. In 2012-13, Saline Area Schools receives the following General Fund Categorical Funding. MPSER’s Cost Offset – as the retirement rate that schools are required to pay for school employees has skyrocketed, the State provided a small offset in 2010-11 and 2012-13 of approximately $100 per-pupil. With retirement reform, it is unclear how long this will continue. School districts receive reimbursement for 28.6138% of their total Special Education program costs, as well as 70.4165% of Special Education Transportation costs from the State. The per-pupil foundation allowance for each Special Education FTE (Full Time Equivalency) is first subtracted. Some of the funding lost from the decreases in the foundation allowance were regained with Federal money in the form of American Recovery and Reinvestment Act Stabilization (ARRA) funds and grants (2009-10 and 2010-11) and then Education Jobs (EduJobs) funding (2010-11 and 2011-12). The continued economic struggles of the State continue to put a strain on the School Aid Fund. In April 2011, Governor Rick Snyder issued “A Special Message from Governor Rick Snyder: Education Reform”. The Governor’s reform measures include a proposed change in the way schools are funded. The Oxford Foundation of Michigan has undertaken the Michigan Education Finance Project, which will propose a replacement of the School Aid Act of 1979. They will be submitting a final report to the Governor in the near future.